Michelangelo was dubious about accepting the commission to paint frescoes on the ceiling of the Sistine Chapel from Pope Julius II. Believing himself primarily a sculptor, Michelangelo was suspicious about who had convinced the Pope to hire him. 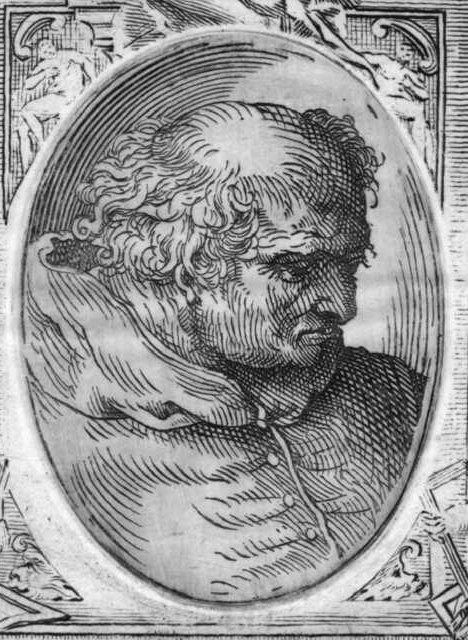 The artist thought that the architect Bramante was attempting to sabotage his reputation by having the Pope make him work as a painter on the ceiling of the Chapel, an area Michelangelo did not believe he was skilled in. Nevertheless the Pope was certain that he wanted Michelangelo and promised him that if he completed this work then he would be able to finish his work on the Pope's tomb. Thus, after some persuasion, Michelangelo enthusiastically accepted the work. However he was not satisfied with painting the 12 apostles onto the ceiling, believing the scheme needed to be grander. 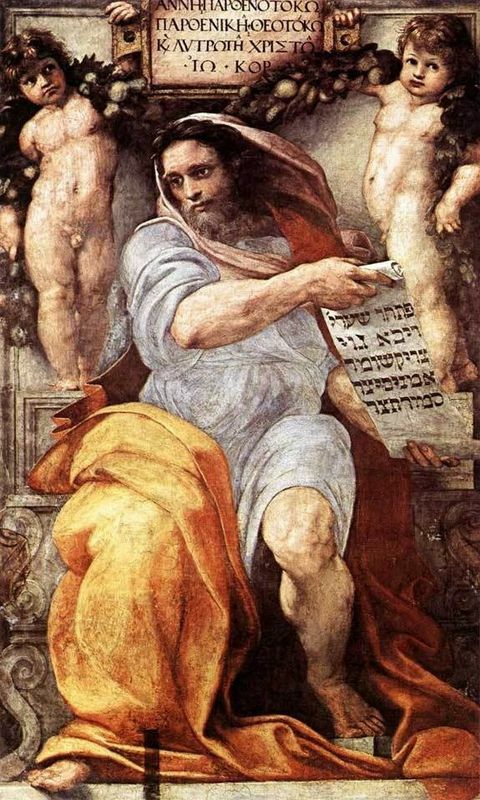 Michelangelo reported that it was he who had decided on painting the scenes of Genesis. Yet many art historians question whether this is factual considering that Michelangelo did not understand Latin. It would have been highly unlikely that the Pope would have trusted the design of the ceiling in one of the most important Catholic buildings to a man who did not understand Latin. It remains unknown who decided on the end design scheme. Michelangelo painted the ceiling of The Sistine Chapel in an upright position, standing on scaffolding of his own design. When Michelangelo took the scaffolding down he twice adjusted the scale of his figures, making them larger and grander. When he eventually finished in 1512 he had painted over 300 figures onto the ceiling and over the years there have been various restorations, the most recent safely removing the dirt and grime and revealing the startling, brash colors he used. When the ceiling of The Sistine Chapel was painted Pope Julius II was attempting to unite the country under the church. The country was broken into different warring factions and there was a constant battle to unite the different areas under a different ruler. In his quest to show leadership the Pope was inspired to commission a number of different works to represent the power of the church. Pope Julius II wanted the country to recognize papal power, and wanted the ceiling of The Sistine Chapel to inspire servitude in other. Consequently he asked Michelangelo to paint 12 grand frescoes of the Apostles. Michelangelo, however, was not inspired by this design, knowing that the apostles had been poor and did not wish to paint them in glory. Furthermore he was not inspired by the small challenge of only painting 12 figures. 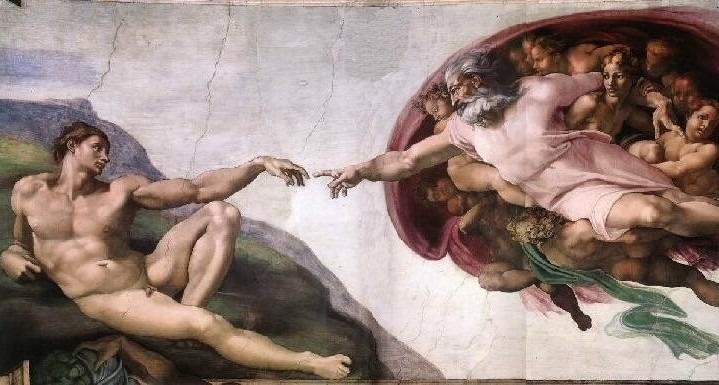 As a result Michelangelo maintained that the Pope had left him to decide what he wanted to paint on the ceiling of the Sistine Chapel. According to Michelangelo's story he had only agreed to paint the frescoes if he could deviate from the Pope's original plan. However it is unlikely that Michelangelo was permitted to paint the ceiling without the input of others. 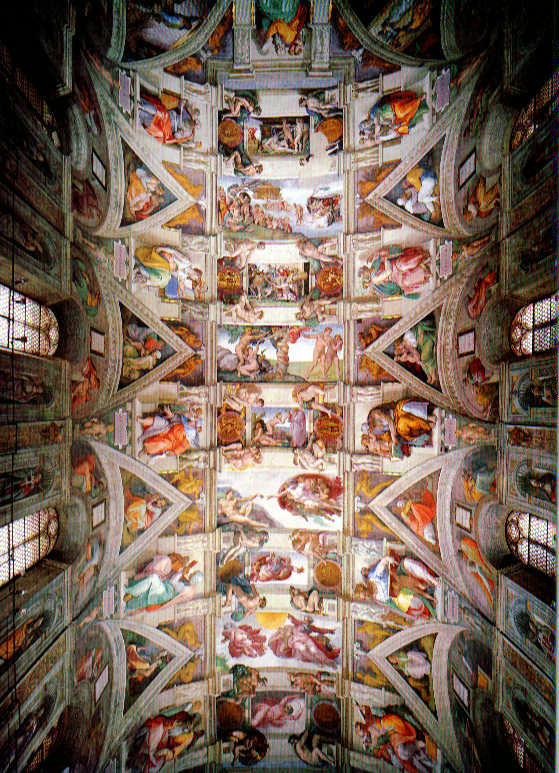 The Sistine Chapel was an important symbol for the Catholic Church and Michelangelo did not speak Latin. Consequently it is said by many art historians that the Pope's cousin Marco Vigerio della Rovere had some input into the design. Even so why the group was inspired to paint the story of Genesis in reverse is not known. No records of who chose the subject matter, or why they painted what they did, exist today. Michelangelo painted over 300 figures onto the ceiling of the Sistine Chapel, which tell the stories from the book of Genesis. Beginning at the entrance is the drunkenness of Noah and over the altar is the scene of God separating the light from the darkness. It took four years for Michelangelo to complete the frescoes, which permanently affected the health of his spine. 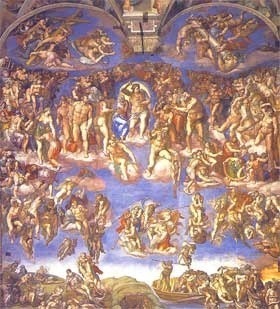 In the center of the ceiling is the iconic image of God giving life to Adam, which has been parodied in numerous images. In the picture God is shown powerful and muscular but dressed in a simple white tunic. In the triangular panels to the side of the central panels are the images of Christ's ancestors and in the corners are the four scenes from the Old Testament. The panels are separated by images of the seven prophets and five sibyls. The figures become larger and grander the nearer to the altar they are. This is because Michelangelo removed his scaffolding after working on Noah's drunkenness to gain some perspective on his work, only to discover that they were not as imposing as he originally intended. The ceiling of the Chapel is painted with bright, brash colors. Prior to the recent restoration the ceiling had a dull, brown tone. However after being cleaned the full effect of Michelangelo's intended color scheme can be clearly seen. The dusky pinks of the robes and the golden yellow of the sun stand out against an egg shell white backdrop. Michelangelo's frescoes are deeply religious and as a spiritual man he painted emotionally charged depictions. His work on the ceiling of the Sistine Chapel augmented what a profoundly pious man he was. Michelangelo fervently began his work in 1508 by making all of his original drawings and planning out his use of space before beginning to create the cartoons. He nailed the cartoons against the wet intonaco (the final wet layer of plaster before a fresco is painted) and transferred the pictures onto the ceiling. He then painted the frescos onto the roof from his specially designed scaffolding. He worked in an upright position, from a platform that curved at the same angle as the ceiling. However after only four months the work became moldy incredibly quickly and had to be scraped off and started again. The artist therefore new plaster made with a formula that was less likely to lead to mold. Michelangelo's frescoes on the ceiling of The Sistine Chapel have been called some of the finest examples of Renaissance fresco painting that exists today. It is estimated that over 10,000 visitors pass through the Sistine Chapel every year. 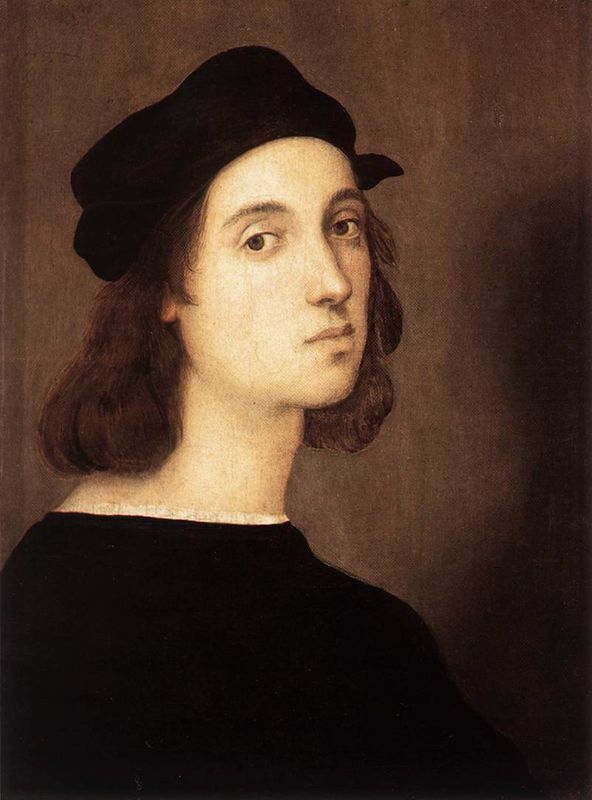 While Michelangelo was working on the ceiling the artist Raphael had already praised his efforts. Having Bramante unlock the chapel for him Raphael went to look at the frescoes and was highly impressed by the grand scale of Michelangelo's work. At the time Raphael was working on an image of Isaiah in Sant'Agostino church. After visiting the Sistine Chapel Raphael scrapped his work and began his painting again, making it much larger and more like Michelangelo's work. Pope Julius II was delighted with Michelangelo's work when it was first shown to him and he praised Michelangelo's devotion to Catholicism. The muscular forms of the figures, their bright tones and the characters complex interactions with each other have made Michelangelo's frescoes some of the most famous images of all time. Few other artists have had the same critical success so long after they have passed away. Today the Sistine Chapel is considered one of the greatest pieces of art that exists and its images have been used in many different modes. The Sistine Chapel has proven itself to be timeless. When Michelangelo was painting the ceiling of the Sistine Chapel he twice removed his scaffolding to gain some perspective and both times he returned to his paintings and made them larger and grander than the time before. As a result, his frescoes were ground breaking because of their scale and magnitude. After viewing Michelangelo's work Raphael returned to his painting of Isaiah with a new design planned. His second figure of Isaiah was much larger and grander than his first, clearly having been influenced by Michelangelo's example. Michelangelo was born March 6th, 1975, in Caprese Italy. His father was a politician and his mother died when he was at a very young age. Michelangelo believe that his sculptural skills were linked to the milk that he received from his nurse maid, who hailed from a family of stone cutters. 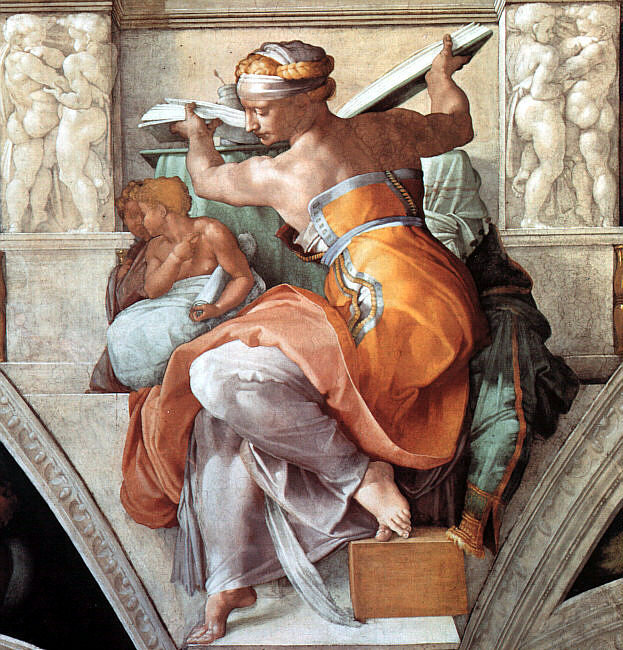 Michelangelo's father attempted to give the young man a classical education but Michelangelo was not interested in studying anything except art and eventually became an apprentice of Domenico Ghirlandaio. It was under Ghirlandaio (one of the most talented fresco painters in Florence) that Michelangelo learnt the art of fresco painting, which would serve him well when he was working on the ceiling of the Sistine Chapel. It was after this period that Ghirlandaio then recommended the young Michelangelo to Lorenzo the Great. 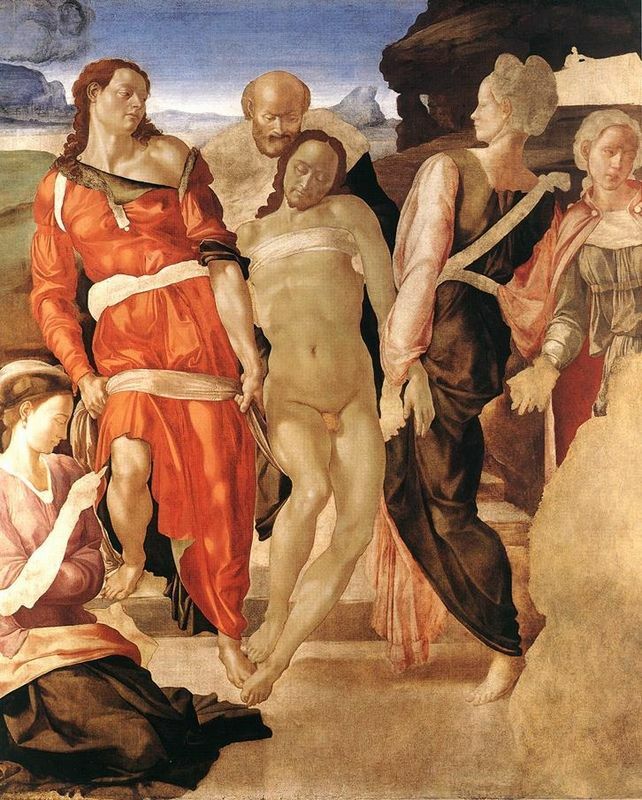 After working at the court in Florence Michelangelo eventually moved to Rome and became known in papal circles. 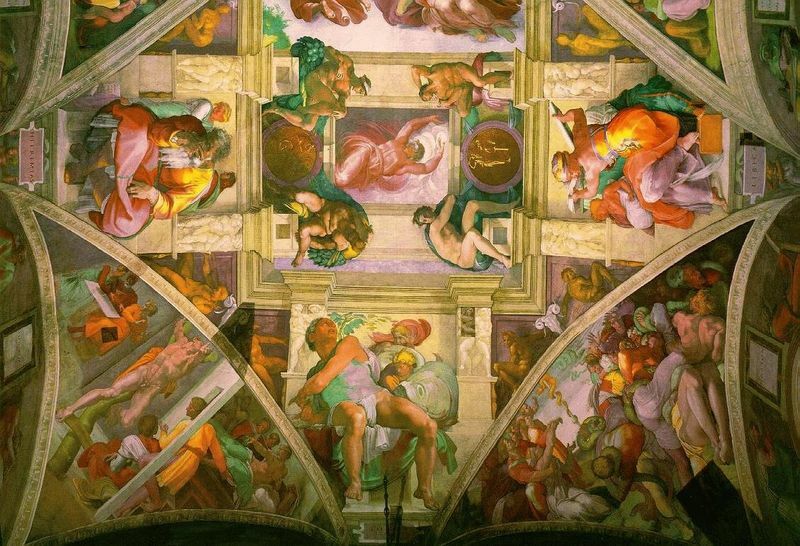 Michelangelo worked on the ceiling of The Sistine Chapel during the Renaissance period. 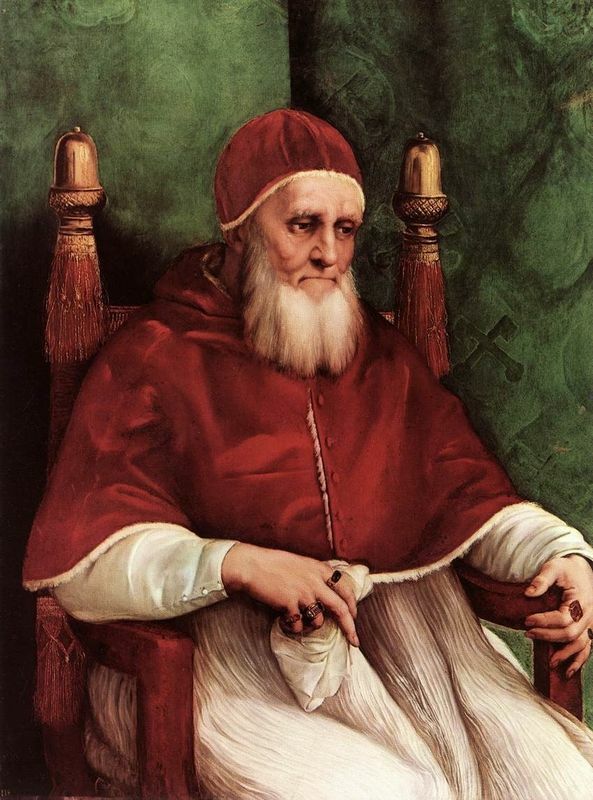 Beginning in 1508 Pope Julius II was trying to unify the warring factions of what is now Italy under the Catholic Church. As a result he commissioned the Renaissance artists to undertake a great deal of art in Vatican City. Renaissance in French means 'rebirth', and is the name given to the artists emerging in the 16th century who were seen to be at the head of an intellectual and artistic evolution. However after Michelangelo worked on the ceiling of the Sistine Chapel many art critics said that he was hailing the Mannerist era. The brash bright colors that were uncovered by the most recent restoration are typical of Mannerist works. Michelangelo's frescoes bridge the gap between the Renaissance and Mannerism. Nevertheless the frescoes are still considered some of the greatest examples of Renaissance painting that exist today.